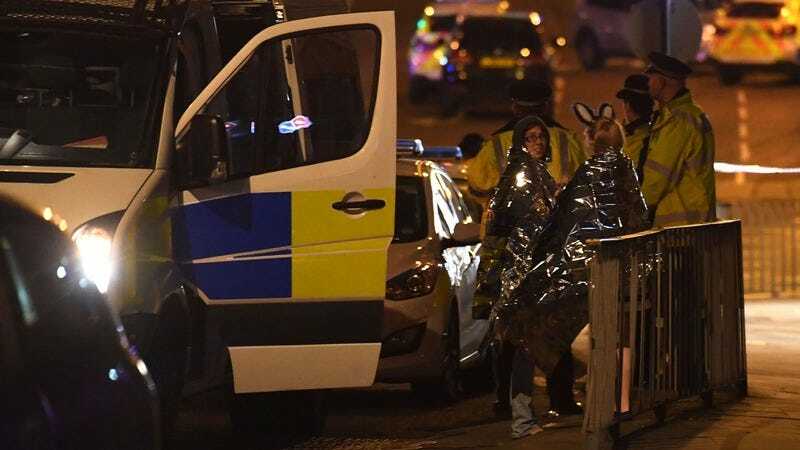 Police in the English city of Manchester say they have arrested a 23-year-old man in connection to yesterday’s deadly terrorist attack at an Ariana Grande concert, Variety reports. The attack was carried out by an as-yet-unidentified suicide bomber, who set off an IED in the foyer near one of the venue’s exits at 10:33 p.m. local time, killing 22 people and wounding 59 others, according to NBC News. Grande’s fan base is young and mostly female, and British prime minister Theresa May says that “many” of the dead were children; 12 of those hospitalized were under the age of 16, according to Pitchfork. ISIS has since claimed responsibility for the attack, but provided no proof. In the hours since the attack, the first victim has been identified: Georgina Callander, an 18-year-old health and social work student who died at the hospital shortly after the attack. Callander was active in a number of fan communities, including Once Upon A Time and the pop group Fifth Harmony, according to BuzzFeed News. Friends and stars of her favorite shows—some of whom she met only a few weeks back at the Storybrooke 3 fantasy convention—have paid tribute to Callander on social media. Grande herself was not injured in the attack, but writes of her devastation on Twitter; she has since canceled the remainder of her tour, according to Stereogum. Her manager Scooter Braun has also issued a statement. UPDATE: Variety reports that Grande’s team has yet to come to a decision regarding the remainder of her tour, and that earlier reports that it had been canceled, like the one cited above, were inaccurate.